Between 20 to 30 volunteers are expected to report for duty at Community Garden Work Day, scheduled 9 a.m. to noon Saturday, March 17 at CRRC’s recreation center, 125 Mabel Jones Rd., Canyon Lake. They’ll help plant a garden that last year yielded 800 pounds of produce for CRRC of Canyon Lake, which used it to feed families who rely on its food pantry for help. On the to-do list tomorrow is preparing soil and planting (but anyone can just watch) this year’s crop. In two to three months, the garden will begin yielding cucumbers, squash, peppers and tomatoes. A hot dog lunch for volunteers follows at noon. Attendees also can enjoy an interactive gardening seminar afterward, hosted by Comal Master Gardener Lee Franzell. But how the garden grows the rest of the year — even with the continued help of dedicated volunteers — depends solely on the efforts of a retired New Braunfels landscaper. Joe Ed Lyles moved to Canyon Lake several years ago. 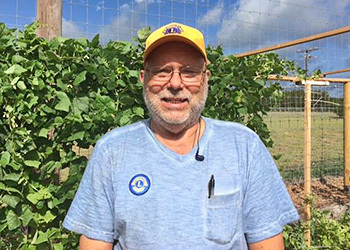 A member of Canyon Lakes’s Noon Lions Club, he noticed the 1/4-acre garden at the CRRC’s Recreation Center. He assumed responsibility for the untilled land in December 2016. In January 2017, plans for the garden crystallized into an action plan. Maureen Schein, CRRC’s resource program director, says fresh fruits and vegetables are among the most expensive items on anyone’s grocery list. The CRRC feeds 500 to 600 people a month. Although the garden’s abundance made a dent in CRRC’s budget, it didn’t grow a second-in-command for Lyles, concerned about planting a future. People who’ve worked with Lyles say it’s a lot of fun, not physically demanding and just plain friendly. Lyles doesn’t mind entertaining those who sit in the shade and visit. He makes sure nobody gets scorched in the hot Texas sun, either. There’s plenty of land to expand the garden but not enough volunteers to help CRRC feed more hungry mouths. By the way, Lyles was a landscaper before he ever gardened. He’s self-taught. All he needs now is to plant a seed in the mind of someone in the community he can teach to keep Canyon Lake’s community garden bountiful for years to come.